A huge part of moving towards intuitive eating is shifting your mindset from one of restriction or scarcity to one of unconditional permission and abundance. 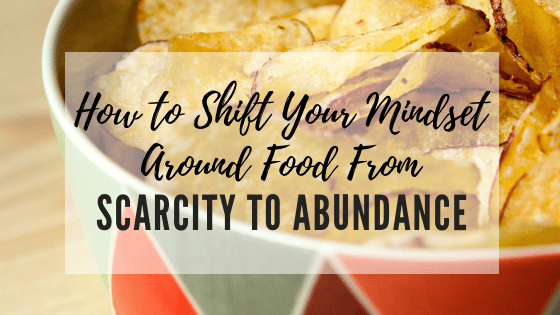 In this post, I share more about ways that you can create an abundance mindset for yourself as you move through your intuitive eating journey. Your mindset plays a huge role as you move towards intuitive eating. 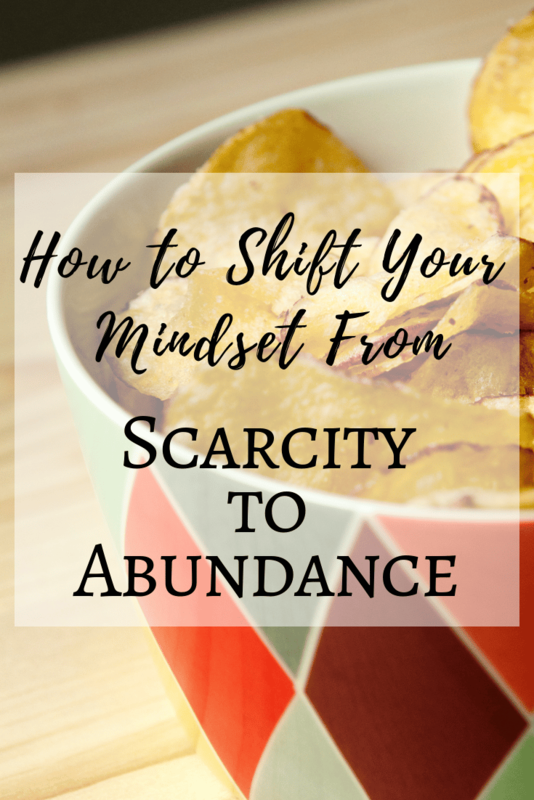 One big mindset shift that I focus on with all my clients: moving from a place of scarcity to a place of abundance. The dictionary defines abundance as plentifulness of the good things in life. That means scarcity is the opposite of this: insufficiency of supply. I shouldn’t have that pasta dish, it has too many carbs. It’s a special occasion, I’ll start over tomorrow. Clean your plate or you can’t have dessert! I better get my share now before someone eats it all. I don’t know the next time I’ll be able to have cupcakes so I better eat it now. When we operate from a place of scarcity, it creates a sense of restriction and urgency. Even if food is not physically scarce (meaning we have plenty of it around us), this mental scarcity makes our body feel restricted. And what does our body do in response to restriction? It triggers an increase in appetite and/or cravings. Which means when we are around foods that we psychologically perceive to be scarce (i.e. those foods we consider “bad”, “unhealthy” or “off-limits”) then it is nearly impossible not to overeat or binge. But what if, instead, you came from a place of abundance? When you change the way you look at things, the things you look at change. When you see all types of food as abundant, plentiful, and allowed – and you keep those foods around you – then eventually you will get to a place where those foods don’t feel as exciting. The abundance helps you habituate to the foods, meaning you get used to them being around and, as a result, end up wanting them less frequently. 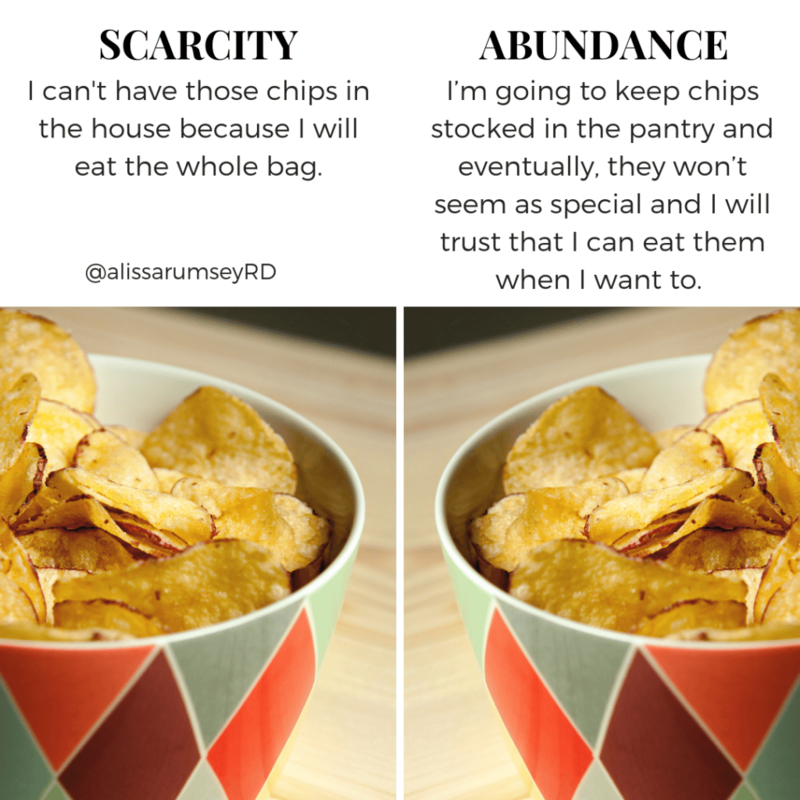 Once you allow all foods an even playing field, and get rid of the scarcity mindset, you are able to tune in to your body to figure out what you really want to eat. 1. Stock your house and/or office with foods you normally consider “off-limits”. Make a list of all the foods that are most appealing to you. This can be any type of food – which foods are your favorite? Which do you love eating? Now go through and put a check mark by the foods you actually eat. Then circle the ones you have been restricting – whether consciously (like on a diet) or subconsciously (through food rules, keeping the food out of your house, etc). Pick one of those “off-limits” foods that you circled and go buy it and keep it in the house. Give yourself permission to eat it whenever you want to. Make sure you keep enough of the food around to create a sense of abundance, so you know that it will be there when you want it. Continue to give yourself permission to eat it. 2. Reframe your thoughts about food. I’m allowed to have ____ whenever I want. There’s plenty of food, I can have some later if I want to. When I’m hungry, I’ll eat again. The food will be there later if I want to have it then. This process will not be easy and if you’ve been keeping a lot of foods off-limits, it can feel really scary. Shifting your mindset is an active process that can take many weeks and even months as you move towards intuitive eating. Don’t worry if you feel like you’re overeating at first, this is totally normal (because remember: overeating will occur in response to restriction and scarcity!). Eventually, as you shift your mindset from scarcity to abundance, and give yourself unconditional permission to eat, you’ll build back body trust. You’ll get to a place where your body will know and trust that you have access to that food (without feeling guilty or ashamed about eating it) and the overeating will get less and less frequent. One of my clients never kept chocolate in her house, as she would eat the whole bag in one or two sittings. But to create an environment of abundance, she bought a big bag of Godiva chocolates. She was sure she would overeat, but as she practiced reframing her thoughts, the opposite ended up happening. She was able to say to herself “If I want some later, I can have some”. And if she wanted them, she ate them. But just by creating that sense of abundance meant that the whole bag lasted her a week, when in the past it would have been gone within a day. Because when you change the way you look at things, the things you look at change. When you see all kinds of foods as abundant and allowed, you eventually get to the point where you don’t feel the drive to overeat. Can you think of a way you can create a sense of abundance – physically and/or mentally – in your food environment this month? Reply and let me know!